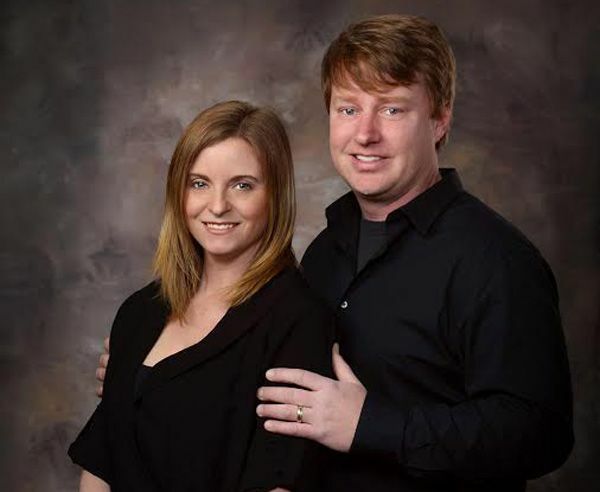 Owners of Frew’s Bridal, John and Erin Frew. A bridal consultant selecting a gown for her customer to try on. 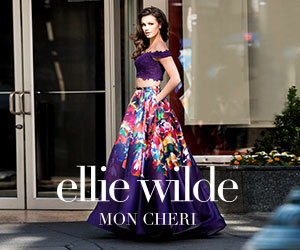 A popular Sherri Hill style in Frew's Prom window. Front window of Frew's Prom Shop. 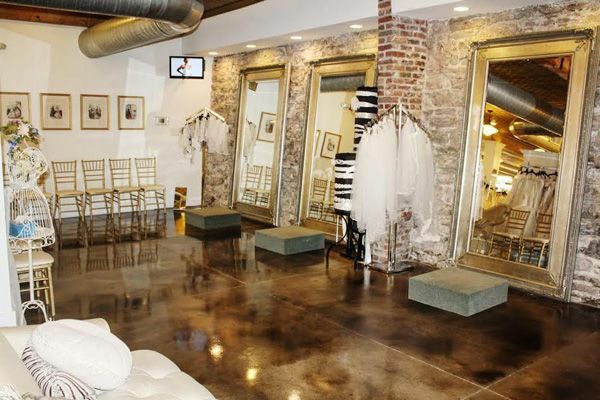 Spacious and stylish bridal fitting rooms. On a Wednesday afternoon in March, John Frew reflected on the whirlwind that has been his last 20 years. 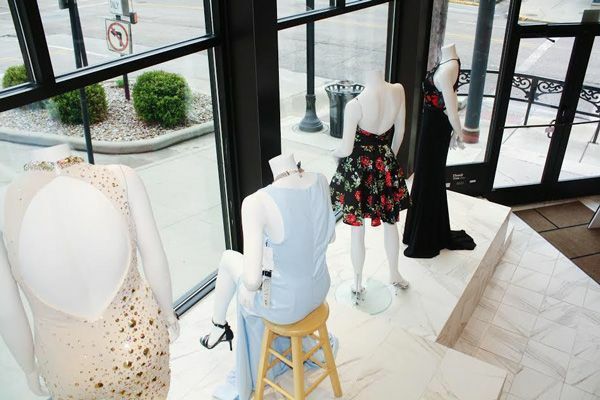 Over the last two decades, Frew has reinvented his namesake bridal store in Alton, Ill., time and again, pivoting the business amid shifting consumer habits, vendor policies, governmental regulations and the ebbs and flows of the U.S. economy. He created and then evolved a dynamic website to save his struggling business, witnessed that same e-commerce play become pinched by industry forces, and finally moved Frew’s Bridal into a new location that aggressively doubled down on the brick-and-mortar experience. It’s been a 20-year run of stress and struggle, success and, finally, stability for Frew. Carol’s, the initial iteration of Frew’s Bridal, opened in 1976, dishing out wedding gowns from a 1,000-square-foot storefront in Godfrey, Ill.
A decade later, Frew’s mother, Carole, purchased the store from its original owner and soon after moved the business into a neighboring 3,500-square-foot space. 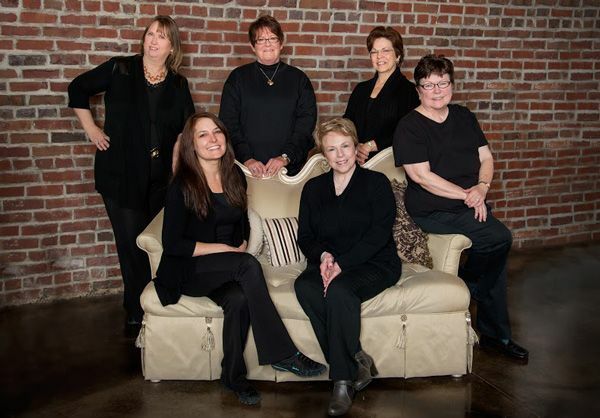 Throughout the 1990s, the business grew steadily, establishing its mark as a trusted bridal outfitter. In 1997, Frew, just a few years removed from earning a business management degree from Bradley University and settled into a job with JCPenney, returned to his childhood home to visit his parents. His mother casually mentioned she had a buyer for the bridal store. Frew told his parents to put that deal to rest: If anyone was going to purchase the store it would be him. Frew had just witnessed a rash of layoffs at JCPenney and, ever the entrepreneurial soul, stood eager to control his own destiny. “I thought I could grow the business,” he says. Frew gave his two weeks notice at JCPenney and soon transitioned into the role as owner of an established bridal shop. Immediately, Frew set to modernize the store, a business on stable footing but in need of a fresh charge. He swapped the shop’s longstanding pen-and-paper methods in favor of a computerized point-of-sale system with inventory management capabilities and also began investing more deeply in advertising. His first full year at the helm was solid, but Frew felt it could be better. “We were hitting the marks we wanted to, but I was still trying to find our groove,” says Frew, who answered every phone call in those opening months because he hesitated to cede control of even the most mundane tasks. As the century turned, Frew could feel the winds of change swirling at an accelerated pace. The store’s sales stagnated and customer traffic slowed – first from a mini-recession and later in the cautious aftermath of the September 11 terrorist attacks. Around this same time, Frew says David’s Bridal also began establishing a deeper foothold in the St. Louis metropolitan area that had long been a Frew’s Bridal calling card. “We probably took a 50-percent cut as they started opening brand-new stores,” Frew says of the now 300-unit national chain. Frew’s Bridal was hurtling toward disaster and its young owner knew it. Frew realized he had to do something different, perhaps even drastic, to save his faltering business. 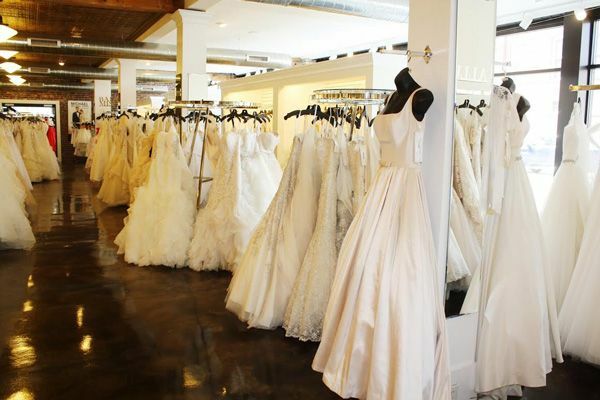 He placed a bet on e-commerce, a then-fledgling reality in the American retail marketplace, and was hopeful he could find a customer base willing to purchase dresses online as in-store traffic and sales continued to fall at Frew’s Bridal. “I thought the Internet was our best avenue to find a bigger market,” he says. In late 2001, Frew launched BestBridalPrices.com and began selling immediately. Simply building a website, however, failed to transform the stumbling bridal store’s fortunes, especially given the Wild West ways of the Internet’s earliest days in mainstream America. Frew studied search engine optimization (SEO) and researched ways that his upstart website could attract a greater audience. “I’d sometimes spend three hours a day blogging and creating different posts to generate traffic,” he says. The calculated efforts produced results as BestBridalPrices.com took off and rescued Frew’s Bridal from near-certain disaster. In the website’s earliest years, Frew estimates that 99 percent of his total business revenue came from online sales. The brick-and-mortar store, in fact, largely became an outlet for Frew to peddle lingering inventory. As the 21st century progressed and e-commerce became more entrenched in the American economy, however, bridal industry leaders began taking steps to create a more orderly, even-handed environment. Manufacturers started monitoring online prices and many dropped retailers who didn’t adhere to their standards. It was a shift, Frew acknowledges, but one he understood. “I’m actually a proponent of set prices because discounting hurts everyone,” Frew says. With the e-commerce landscape changing, Frew realized a virtual store could not be his sole long-term play. A productive and profitable brick-and-mortar store was a necessity and Frew knew he needed to break the brick-and-mortar code that had so far baffled him. “It was becoming clear to me that the Internet wasn’t always going to be so viable and that I absolutely had to make an investment in the brick-and-mortar store,” he says. With an eye on moving Frew’s Bridal into new quarters, Frew and his wife, Erin, toured a pair of rundown, adjacent buildings in Alton’s historic downtown about seven years ago. The buildings, which had previously housed a clothing and dry goods store as well as a Sears Roebuck outlet, sat on U.S. Route 67, the main highway adjoining Illinois and Missouri and a well-trafficked road in southern Illinois. Despite the prominent location, Frew quickly rejected the century-old brick monstrosities that had been vacant for more than 20 years. Erin, however, persuaded him to reconsider and began detailing her vision for the space. The Frews developed a new business plan and readied their financials, soon after negotiating a deal with the city, which had previously acquired many of the downtrodden block’s buildings in an effort to spur redevelopment. “It was a bold move, no doubt about that,” Frew says of the two-building purchase. For the next two years, the Frews devoted themselves to rehabbing every inch of the 28,000-square-foot structures, knocking down adjoining walls to create one free-flowing space, sandblasting and salvaging vintage tin ceilings, pouring new concrete floors, refinishing hardwood floors and installing an entirely new electrical system, including an elevator. Serving as the project’s general contractors, Frew and Erin completed as much of the work as possible themselves. The mission and urgency of the project propelled the Frews’ efforts, day after day, night after night. 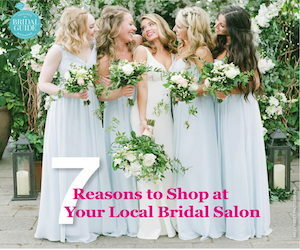 The expansive space allowed Frew to be ambitious and he ramped up inventory to establish Frew’s Bridal as a robust, something-for-everyone, full-service bridal boutique. Today, the shop contains about 1,500 bridal gowns, 1,600 bridesmaids dresses and full size runs of more than 100 different prom styles. Frew’s attracts customers from throughout the country, though its core audience comes from about a two-hour radius. While the store’s main level hosts its expansive inventory of gowns, the building’s second level largely serves as the company’s administrative hub, housing a call center, shipping and receiving arms, offices and conference room. 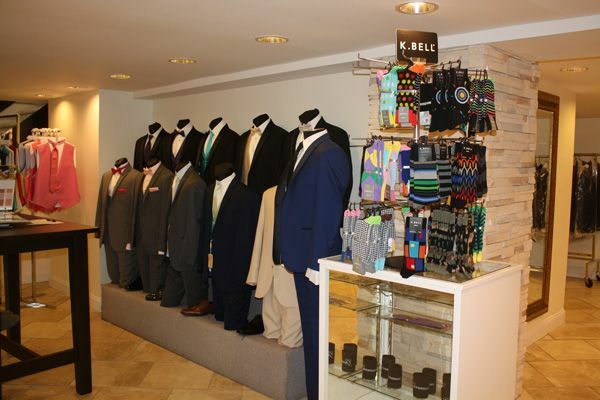 A 3,800-square-foot basement space, meanwhile, has been dubbed the Man Cave and features the store’s tuxedo business alongside leather couches and flat-screen televisions. “The square footage makes it nice and comfy and has established us as a one-stop destination shop,” Frew says, adding that being open seven days a week has proven to be another key competitive advantage. 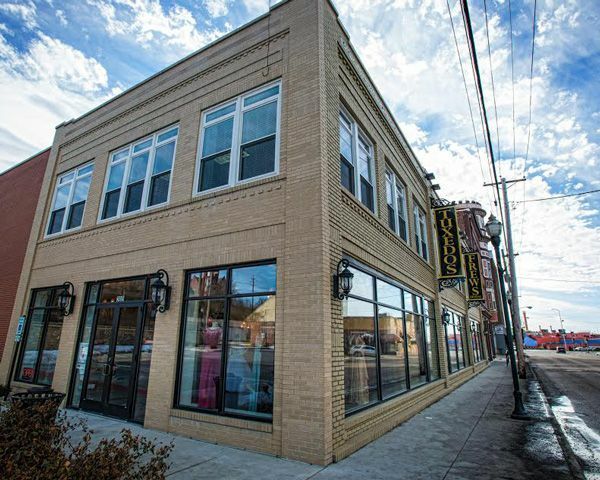 Five years after opening its new storefront, Frew’s Bridal enjoys a stronger present and an even brighter future, as Frew and Erin continue working to build the business in a competitive, often-fickle marketplace. Frew handles many of the company’s back-office tasks, including all finances and advertising, and is also the point person for bridal shows, which he attends regularly to promote the business and drive traffic. At these events, Frew eschews chairs in the booth, so he can easily approach brides and introduce his store. Erin, meanwhile, oversees the purchasing and, not surprisingly given her artistic talents, anything creative for the store, from website graphics to in-store signage. “She brings a skill set few business are lucky enough to have,” Frew says. It’s all culminated in a successful run for Frew’s Bridal, which has seen revenues grow year after year and reinvented itself in the face of shifting competitive pressures.